The Minim OSD Rev. 1.1 is a minimal Arduino-based on-screen display board. 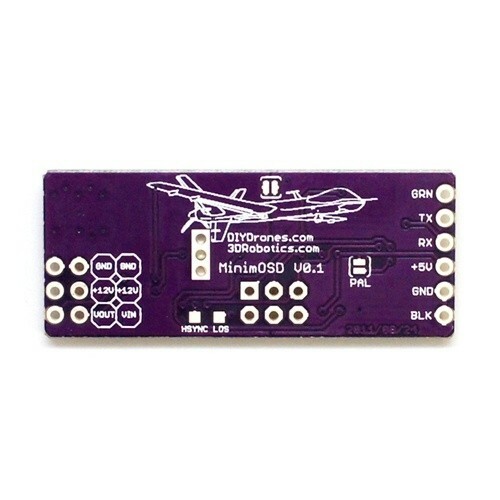 It's tailored for use with ArduPilot Mega 2.6 and the MAVlink protocol. 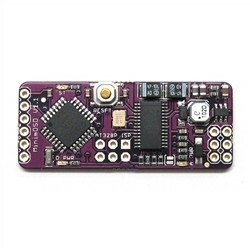 It has been designed to be as compact as possible; the dimensions are just 0.7"W x 1.7"L (2.4" w/ pins as shown) x 0.3"H. The Minim comes with the pins soldered in place on the board. The main components on the Minim OSD are an ATmega328P 8 bit micro controller with an Arduino boot loader and a MAX7456 monochrome on-screen display. Programming is done through an FTDI-compatible 6-pin header. The MiniM OSD features two independent power and ground sections to isolate the OSD's analogue stage, there is a +5V section for the ATmega and the OSD's digital stage, powered through the FTDI cable or other +5V source; and a regulated +5V section for the OSD's analogue stage, powered through the video in / out header and capable of handling up to +12V input. Solder jumpers are available to combine the two power and ground sections if desired. The latest updates to the Minim OSD allow a great number of customisations to the OSD system. The Minim OSD is now the easiest OSD to set-up and use out of all ArduCAM OSD's resources. Positioning panels by drag or numeric input. Save and load layouts from file. Save and load layouts from board's EEPROM. Test video mode switching with adaptive layout. Test the layout with telemetry logs from Mission Planner. ATmega328P with Arduino boot loader. FTDI cable compatible pin out. +5V 500mA regulator for up to +12V supply input. Solder jumper for PAL video option. Exposed test points for HSYNC and LOS. Dimensions: 0.7"W x 1.7"L (2.4" w/ pins as shown) x 0.3"H.